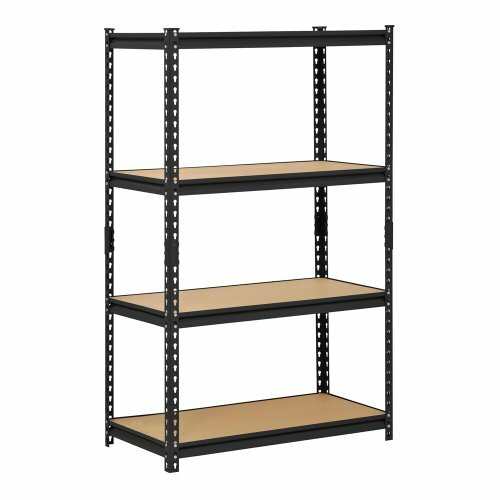 This Edsal URWM364BLK storage rack has a frame made of steel for strength with a smooth black finish for resistance to corrosion, four adjustable particle board shelves, and a 2,000 lb. capacity when the weight is evenly distributed across all shelves. It is suitable for organizing and storing items. The shelves are supported by double-riveted beams and braces for strength, and adjust in 1-1/2" increments to accommodate items of varying heights. The posts on this shelving unit have a two-piece design so it can be assembled vertically to create one 60 x 36 x 18 inch (H x W x D) unit, or assembled horizontally to create two 30 x 36 x 18 inch (H x W x D) units with two shelves each. (H is height, the vertical distance from lowest to highest point; W is width, the horizontal distance from left to right; D is depth, the horizontal distance from front to back.) This shelving unit's rivet lock design requires no nuts or bolts for assembly. Assembly instructions are included, tools for assembly are not included.